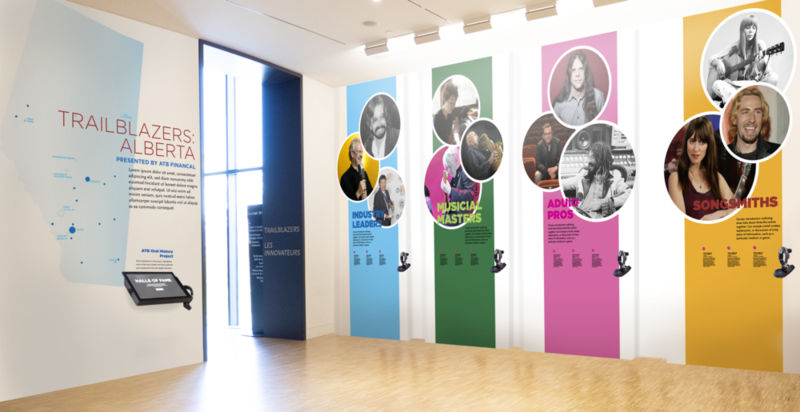 The refreshed gallery focuses on Albertan talent and showcases NMC produced video content. I developed a flexible, reactive exhibit alongside the Collections and Exhibitions team. 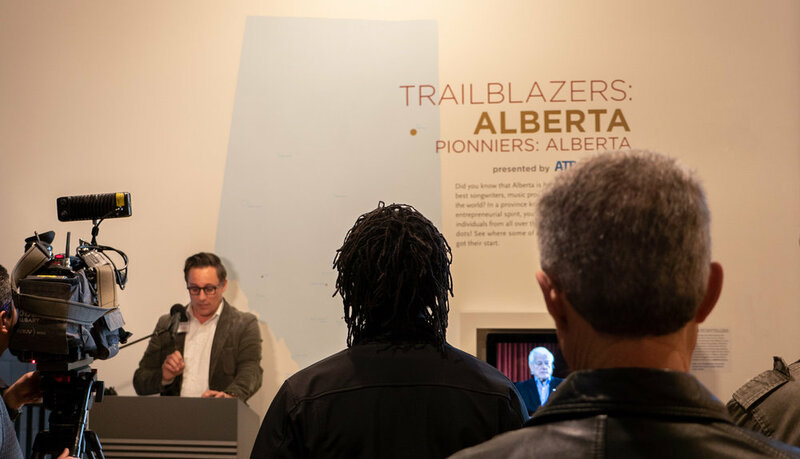 The updated gallery showcases content from ATB Storytellers, an oral history project featuring in depth interview with Albertan music personalities. As part of the proposal, I suggested flexible themed clusters. This was to create modular units that could be updated one at a time. The content creators took this format and used it to demonstrate the diversity of roles in the music industry and showcase talent on stage and behind the scenes. Once the project was approved, I designed the exhibitions to incorporate interactive audio elements. I also designed templates and UX elements for video kiosks. Once the designs were approved, I finalized and formatted the files for print/project. After testing and installation, the exhibition opened on October 26, 2018 with a media event featuring some of the trailblazers featured in the exhibition. 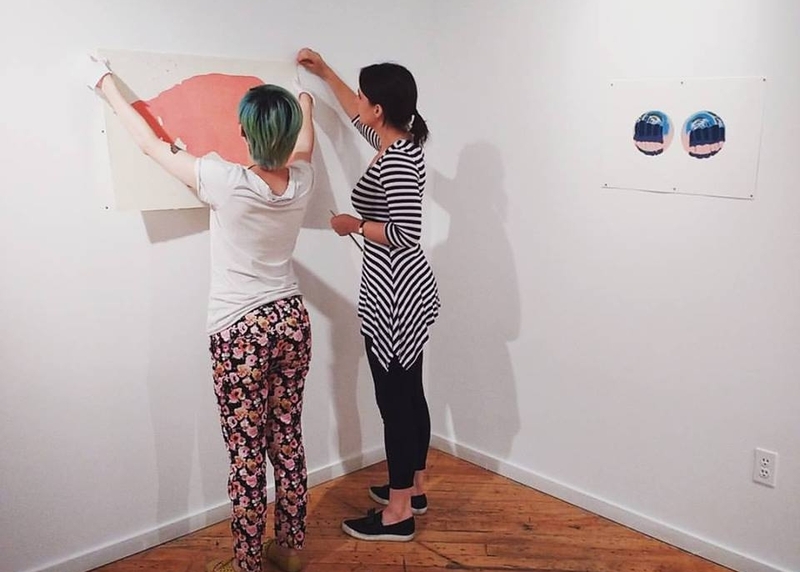 During the summer of 2016, I interned at the Open Studio Printmaking Center in Toronto. As part of our internship, my fellow intern Bridget Collings and I collaborated on a large group exhibition, titled Summer Salon, which opened on the last day of our internship. Bridget and I curated the Salon from recent fundraising proofs donated to Open Studio by artist members. The sale of fundraising prints go towards the operation budget and helps subsidize member’s use of the studio facilities. Bridget Collings and I installing Lauren Nurse's 'Black Cat'. 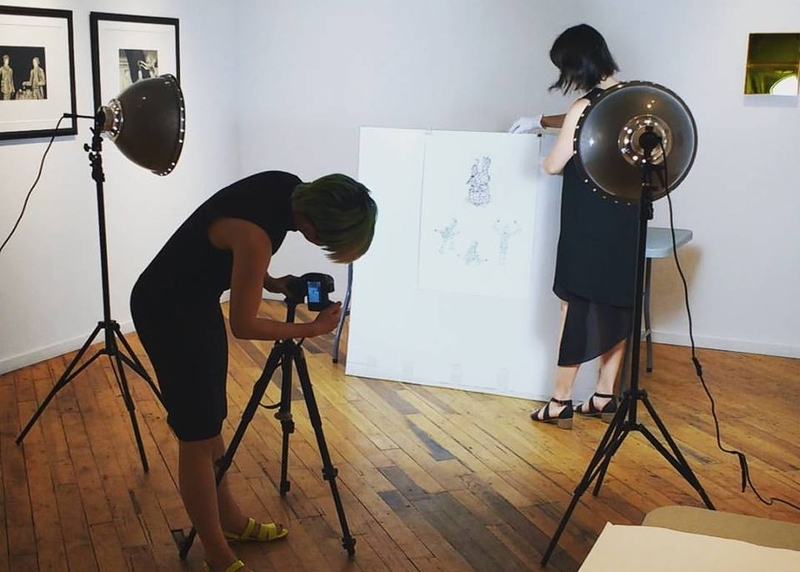 Bridget Collings and I photographing additional work by Catherine Lane, the artist featured on the promotional material for the Summer Salon. After Astrid Ho, the Print Sales & Archive Manager, approved our print selections we fulfilled the additional responsibilities needed to put on a show. This included: writing publicity copy and co-authoring the show statement, I also organized the publicity materials including online listings and designing the printed collateral and collected the artists’ CV and statements and we both installed the show. Echoes of the explosion will be a location-aware audio tour of the Halifax waterfront. Composite characters built from archival records will guide visitors through six responses to the Halifax Explosion. The mobile application was conceived in partnership with the Maritime Museum of the Atlantic. The project requires coordinating between Halifax and Toronto teams. To keep up with the project, like our Facebook page.